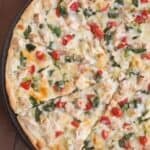 White Garlic Chicken and Vegetable Pizza with my favorite creamy white garlic sauce and the BEST homemade pizza crust! Pizza is my weakness. (And chocolate cake, because, well…it’s chocolate cake). Just throwin’ that out there. I love every type of pizza, whether it’s a paper thin crispy crust margherita pizza, Chicago-style thick crust or a super cheesy New York Style Pizza. I don’t discriminate 😉 . I have a TON of homemade pizza recipes on my site in lots of different flavors. However, my crown jewel of homemade pizza is my perfect pizza crust recipe! I’ve experimented with soo many pizza crust recipes over the years that I’ve lost count, until final this recipe was perfected. It has a perfect crisp outside and tender inside and great flavor. Were throwing it WAAAY back to update a recipe I published three and half years ago! Despite the terrible photo the recipe (this white garlic chicken and veggie pizza) was really popular, and is one of my personal favorite pizzas! Have you ever tried the white garlic veggie pizza from Papa Murphy’s? That’s where the inspiration for this pizza came from. I wanted a delicious white garlic pizza sauce as the base. Then I added all of the veggies I love from that pizza. The artichoke addition is my favorite. 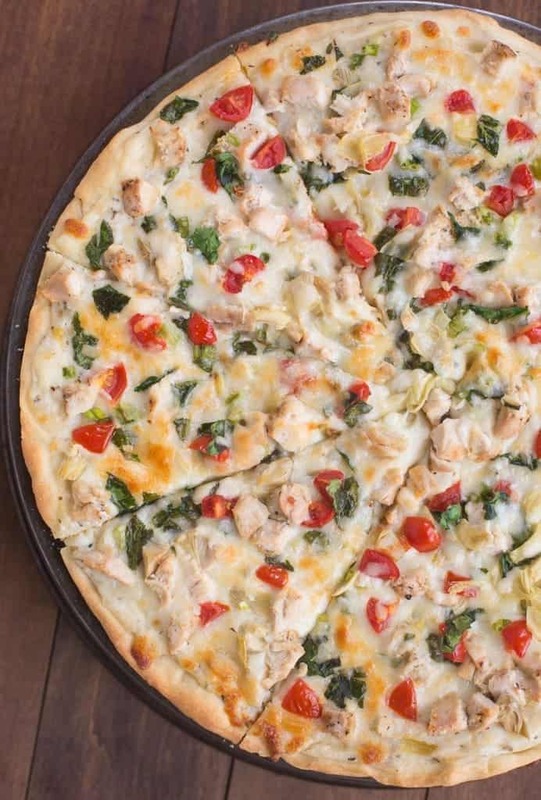 I also decided to add chicken because we love grilled chicken on our pizza and it adds extra heartiness and protein. You can definitely leave out the chicken if you want a vegetarian pizza. Although you could use store bought pizza crust, I feel like there’s nothing yummier than a great homemade pizza crust for this recipe. I detest the pizza crusts that come in the tube/can, from the store. They taste like biscuit dough. If you have the time, you wont regret making homemade crust. The only store-bought crust I’ve found that I like is from Trader Joe’s. It’s fresh pizza dough and comes in a bag. It’s a good option if you’re in a time crunch. Melt butter in a small saucepan over medium heat. Whisk in flour until smooth. Cook, stirring, for 2 minutes. Gradually whisk in milk and cook for a few minutes until slightly thickened. Add salt, pepper, garlic and basil. Mix in Parmesan cheese and stir until the cheese has melted. Remove from heat. Sauce will thicken as it stands. For one regular pizza crust (using homemade dough) I like to pre-bake the dough for 5 minutes at 475 degrees F., before adding the toppings. After 5 minutes in the oven, remove the crust. Spread crust with an even, smooth layer of white garlic sauce. 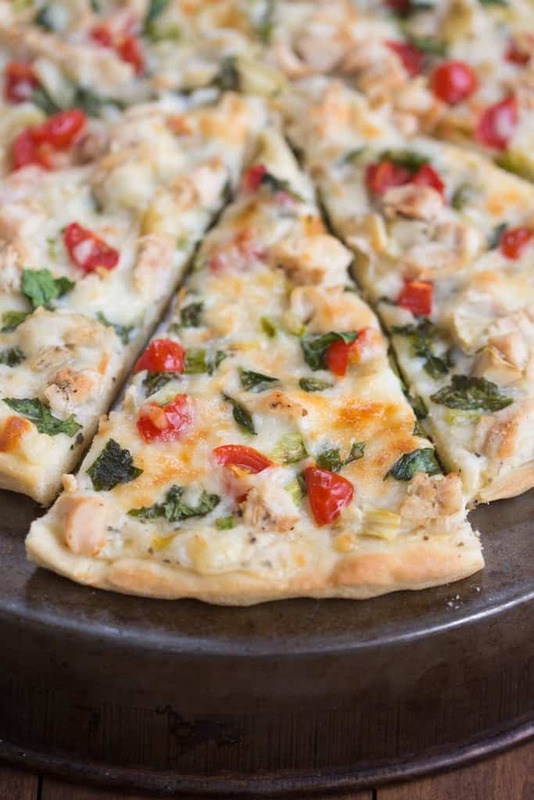 Sprinkle with cheese, chicken, vegetables, and more cheese on top. Return to oven at 475 degrees F for about 10-12 more minutes, or until golden brown. Perfect “January food”. Thank you very much and have a pleasant day ! So I am having trouble finding the recipe…………where is it located please? Hi Pat, I’m so sorry, my site had a some technical problems this morning for a short window of time. It should be fixed now! Let me know if you need anything else! Hope you enjoy the pizza! I am making this right now and just re visited the website for a look at the picture because I wasn’t sure what order the veggies and cheese go in, and whether the spinach should be cut up. I guess you chop the spinach, yes? Hi Gayle, I usually chop up the spinach a little, but you can leave it whole, whatever you prefer. I layer the sauce, a little sprinkle of cheese, then the chicken and veggies, and the rest of the cheese on top. Do you think I could make this pizza a day ahead and keep in the fridge before baking? Hi Daisy, if you make it with the homemade crust then pre-bake the crust for 4-5 minutes, add toppings and refrigerate overnight. Bake as directed the next day. That would work great! My daughter has recently been asking to put chicken on her pizza. It just doesn’t sound good to me with a regular pizza sauce. This white garlic sauce may do the trick, can put on veggies that she will like and not have to do a half and half. Absolutly! Hope you enjoy it! Could this be froze after making? I wasn’t sure because of the milk in the white garlic sauce. My son is looking for a pizza recipe for his 4-H Food Preservation project. Hi Kristina, I haven’t tried this one specifically so I can’t say for sure how it would turn out. Let me know if you decide to try it! I made this pizza a few months for a game night at my church and it turned out great! I absolutely love the sauce! I’m actually going to use just the sauce this week over some zoodles!! 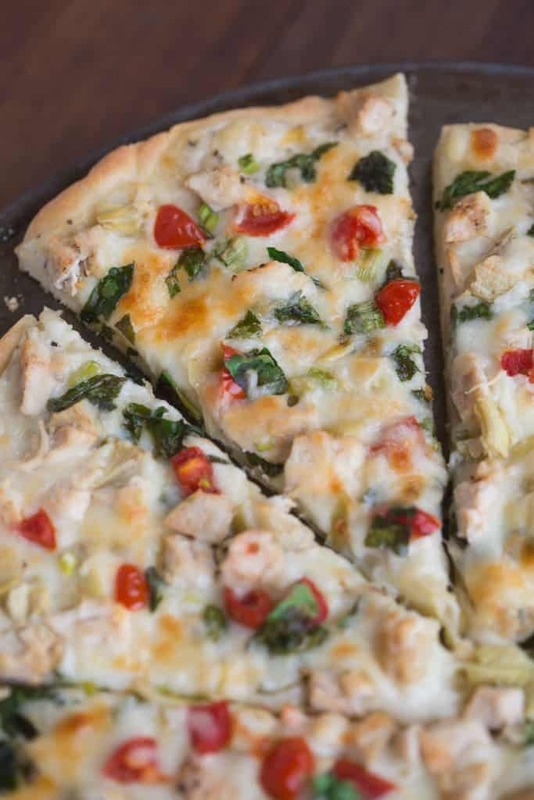 This is my absolute favorite garlic chicken pizza recipe ever!! I love the homemade white sauce and will never go back to store bought white sauce again! Sure, that should work great. I’d suggest almond or soy milk. Can you make this dough a day ahead and let it just sit in the fridge in a sealed ziplock? ?